1. Song title area - this area displays the song title, song tempo, and the time position of a song. 2. Add menu - clicking on the plus (+) icon shows the options to add a track, an effect, or a part. This is an instrument chosen from a grouping of instrument groups, track variations, and tone variations. Examples of a tone variation for an acoustic guitar are 12 string guitar, amped guitar, chorused acoustic guitar, wah guitar, etc.. Tone variations can be previewed before selecting by clicking on the play button. This is a special track chosen from a grouping of effect category, group, and sound effects. Sound effects can be previewed before selecting by clicking on the play button. A part is an 8-bar sound block, about 18 to 24 seconds in length, depending on the tempo of the song. There are a total of 45 unique chord progressions that can be applied to a part. 3. Track menu - clicking on the tool icon shows the options to control the track's volume, turn all blocks on/off, make a copy of the track, and delete the track. 4. Tracks - see what is a "track" on #2. 5. Current genre - this area displays the current genre of the song. 6. Master volume - controls the overall volume of the song. 7. Play/pause - clicking on this button starts and stops the song. 8. 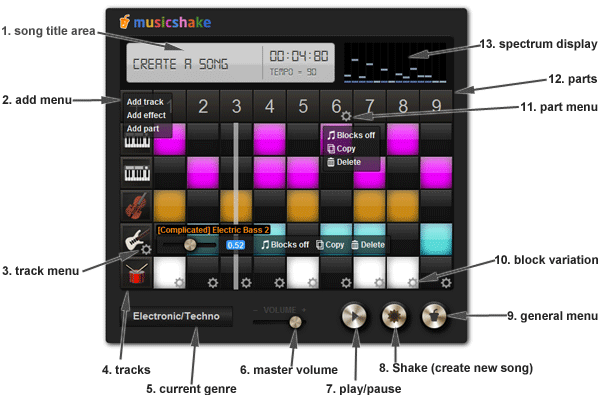 Shake (create new song) - clicking on this button creates a new random song. 9. General menu button - clicking on this button opens the menu. 10. Block variation - clicking on the tool icon shows a list of variations available for the block. Drum tracks and solo melody tracks usually have block variations. 11. Part menu - clicking on this tool icon shows the option to turn all blocks on/off, make a copy of the part, and delete the part. 12. Parts - see what is a "part" on #2. 13. Spectrum display - this is a mini spectrum analyzer that shows the levels on different frequencies for a song. 1. Instruments list - clicking on an instrument icon shows the list of track variations under the particular instrument. 2. Show favorites - clicking on this favorites icon will only track variations that have been favorited by the user will be shown. 3. Track variations - this is the list of different rhythms or melody lines created with an instrument group. Track variations have two parts - a style, which is descriptive of the nature of the rhythm or melody, and the type of instrument. 4. Mark as favorite - clicking on this icon will mark a track variation as a favorite. 5. Style/genre filter - the filter is applied to the track variations list. 6. Preview - clicking on the play button of any tone variation will start the preview. 7. Tone variations - this is the list of different instruments or audio filter applied to a given melody or rhythm chosen from the track variation. 3. Preview chords - clicking on the play button of the chord will start the preview. 4. Preview instruments - clicking on the instrument label will change the instrument that plays the previews. 1. Effect groups - effects are grouped by effect category, group, and sound effects. 2. Effect preview - clicking on the play button of effect will start the preview. 1. Saved song list - this is a list of songs created by the user. 2. Drag handle - click and drag this handle to reorder the song and place it wherever the user wants. 3. Delete song - permanently delete the song from my songs. 4. Copy song - make a copy of the song; this feature can be used if the user wants to leave a song as is, and create an extra copy to make a different version of the song. 5. Rename song - simple rename feature.